Phase 1 of construction is complete! The simulation center now has more than 7,500 square feet of learning space. 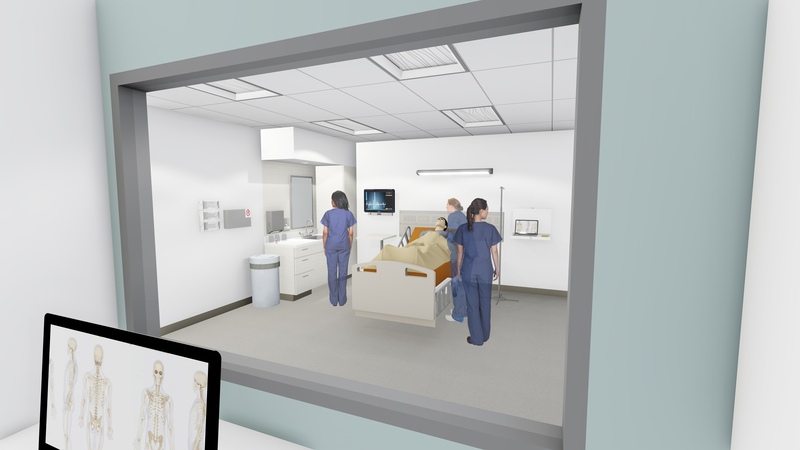 Phase 2 construction will add an additional 10,000 square feet, more than tripling the size of the current simulation center. 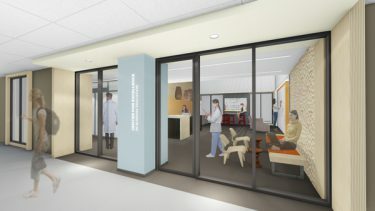 The entrance to the simulation center will move to a new location on the sixth floor of the Health Sciences Building, T-Wing, across from classrooms. The entry will feature a glass wall along the hallway corridor and will become a focal point of the sixth floor. A skylight will flood the space with natural light, creating a welcoming learning environment for students. 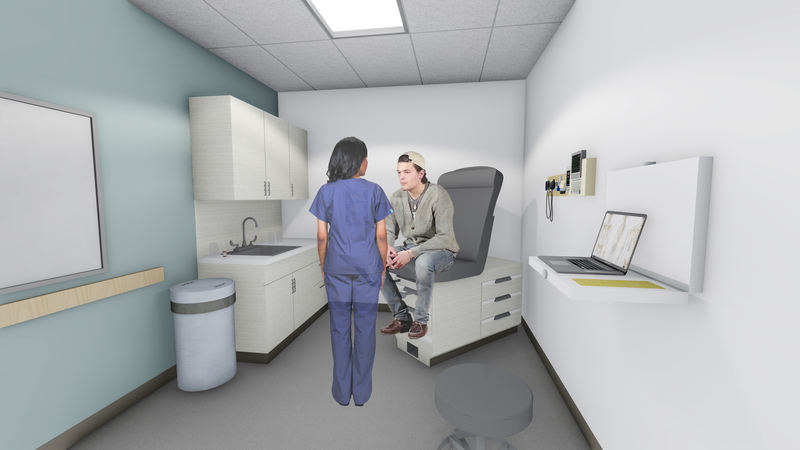 The simulation center will include eight exam rooms (four opening with phase 1 and an additional four opening with phase 2) providing an authentic environment for student learning. Students will use these rooms to practice patient assessments and procedures that they will perform in clinical settings as professional nurses. An expanded inpatient setting will feature beds and equipment that is standard in hospital units. 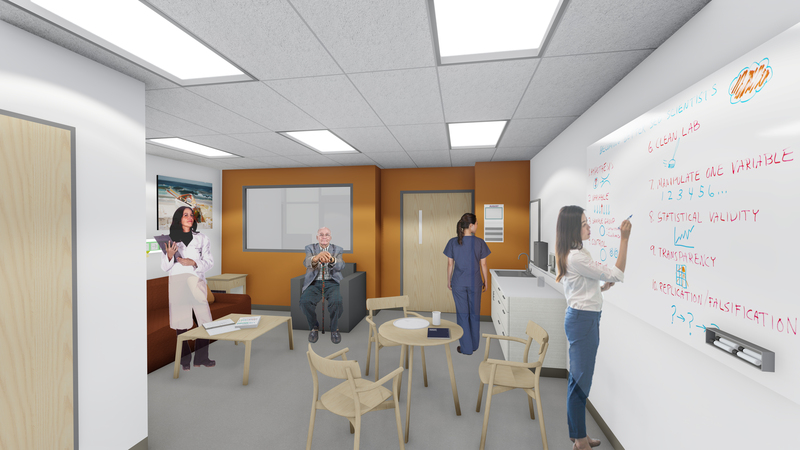 Students will practice skills they’ll need in inpatient settings using mannequins or standardized patient actors, as well as work in teams to role play patient care scenarios they may encounter in a community hospital. Student evaluation is crucial to a nurses’ future success. This control room allows the instructors to monitor the students’ work and observe team dynamics in action. When using mannequins, the instructors can change the patient’s status in response to student interventions. 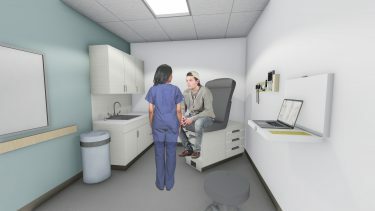 This prepares students to address unexpected complications or unplanned reactions they may encounter with real patients. Today’s healthcare is often provided outside the hospital or clinic, in a patient’s home. 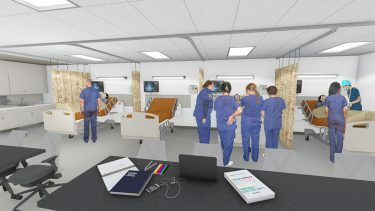 In this space, students will learn to care for a patient in their home and apply their skills to non-traditional environments. They will also learn to consider real-world conditions when determining a patient treatment plan. 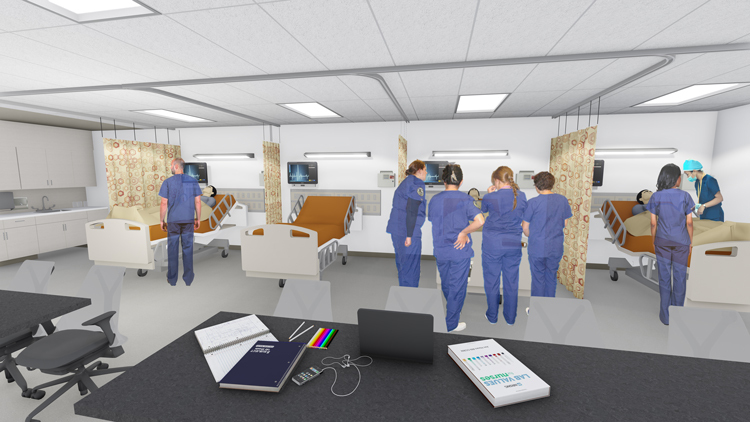 Learning in a modern simulation setting provides a realistic, professional experiences for nursing students, which is especially important because opportunities to learn in clinical settings are increasingly limited. Learn how you can help provide these opportunities.